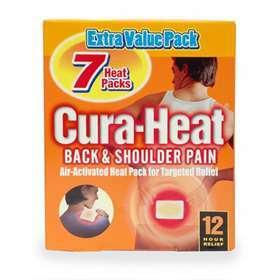 Cura Heat 12 Hour Back and Shoulder Pain heat packs provide targeted, temporary 12 hour warming relief from minor muscular and joint aches and pains. Just open the sachet and apply to clothing/underwear where the heat radiates through to the source of pain increasing circulation, decreasing stiffness and relaxing sore muscles. Contains Cura Heat 7 Heat Packs. 12 hour targeted pain relief. Peel away from the paper strip. Cura-Heat is air activated - do not open the sachet until you are ready to use it. Warning: If misused heat packs can cause burns even at low temperature. Follow instructions and monitor frequently. If heat pack becomes uncomfortably hot remove immediately. Each heat pack is single use. Do not use Cura-Heat whilst sleeping. Do not use Cura-Heat in conjunction with other creams, rubs or lotions applied to the skin or with/ near to other heat sources. If you have: rheumatoid arthritis; poor circulation; nerve damage; a skin condition; are diabetic or pregnant contact your doctor to make sure that heat therapy is appropriate for you. Do not use Cura Heat on children.